Spray 6-quart Instant Pot™ insert with cooking spray. Select SAUTE; adjust to normal. Heat oil in insert. Add beef in 2 batches; cook 2 to 4 minutes on first side until browned. Turn; cook 2 to 4 minutes on second side until browned. Select CANCEL. Return beef to insert. Add broth, chiles in adobo sauce, garlic, taco seasoning mix, cumin, coriander and salt to beef in insert. Stir in onions. Secure lid; set pressure valve to SEALING. Select MANUAL; cook on high pressure 45 minutes. Select CANCEL. Set pressure valve to VENTING to quick-release pressure. Shred beef; toss with 1/2 cup of the cooking liquid. Discard any remaining cooking liquid. 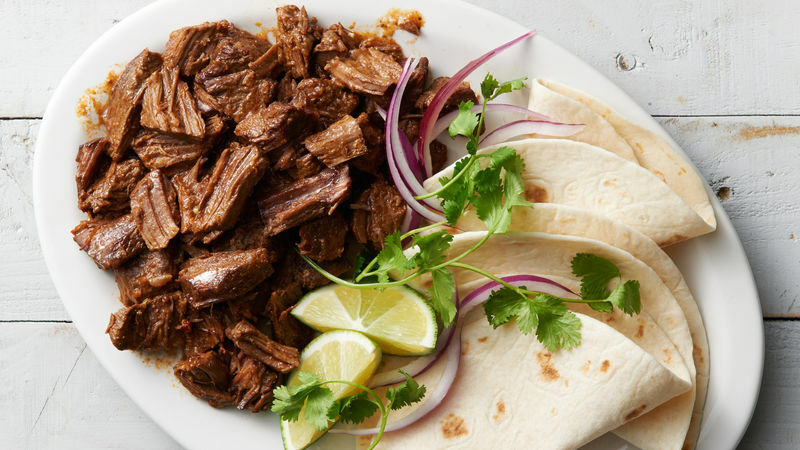 This beef is so tender, it can be shredded by just pressing down on the meat with a dinner fork. Can’t find beef stew meat? Substitute a 2 1/2- to 3-lb boneless beef chuck roast. Cut in 1 1/2- to 2-inch cubes, and trim off any large pieces of fat before browning.